"LT will have a playable thing as of this weekend"
"After this weekend, I hope I will have presented you guys with this smoldering corpse [of perfectionist Josh]"
"The code has been flowing very rapidly since last week, but I still need torrential amounts of it! Story of my life." "Please do keep in mind that what I will be demoing will not be "Limit Theory" in the full sense (again, if I could do that, we'd be in beta). So let's not get TOO hyped up, you're not going to see 1000 ships & a full economy working"
" look for the 6'2" 25-year-old with that "I feel like I'm already 80" look on his face, who will probably also look like a zombie because he almost certainly won't have had any sleep for a long time"
"So super fun new development. I just burnt my [560GTX that's been with us since the beginning] graphics card out. Like, literally, I killed it with the demo"
"The demo that I showed off was built in about a week...As usual, I managed time poorly and would have had more features in the demo had I started earlier." "Perfectionist Josh is dead. There can honestly be no question about it. To even get it working in time, I had to muster duct tape and hacks like I've never mustered before. I cheated physics in ways that would have never even occurred to my little elegance-loving brain in the past. I cut my original grandiose goal down to the bone, literally re-organizing my 'critical features' priority list every hour or so as it came down to the wire, and slowly accepting that more and more things would not make it. Sounds bad, right? But in the end: there was something playable." 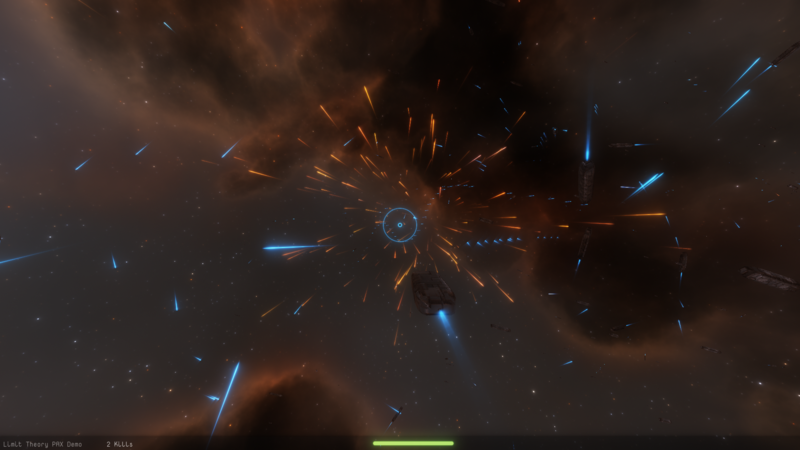 "The demo was very simple, consisting of nothing more than a massive, free-for-all battle of 100 to 500 ships (I varied it through the day), many of which were hunting the player. 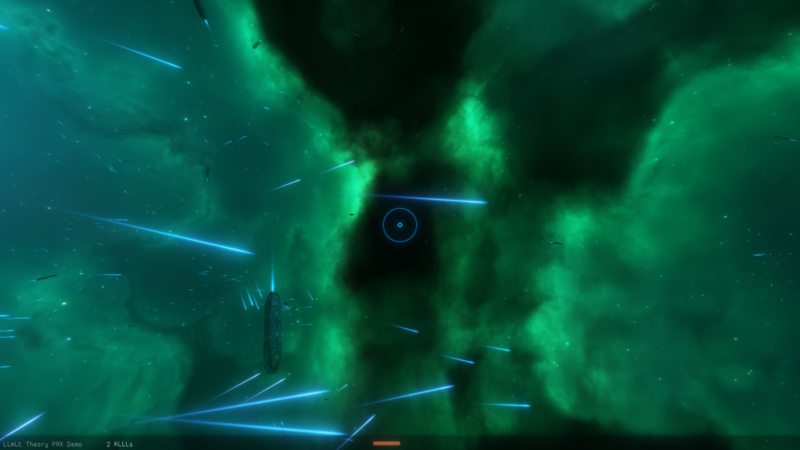 The player had a small (box) ship, equipped with two pulse lasers. Controls were simple and included your standard LT-esque 6-DOF flight, shooting, switching between 1st/3rd person camera, (implemented later on in the day) a thrust booster, and (my favorite) a 'generate a new system' button (which, of course, included generating a new procedural nebula, starfield, configuration of ships, etc). As you can probably imagine, the original plans included way more (two warring factions, a 'home base', purchasable upgrades, etc...), but...*snip snip*"
"Interestingly, I think I garnered more attention at the booth during those times when I was live-coding more features into the demo and gvim was up on the booth's screen. Perhaps I should have just coded at the booth on Saturday instead of in the hotel"
"All-in-all, it was quite a simple demo, but it did have the taste of Limit Theory to it, and it was, in my estimation, quite a decent bit of fun for a relatively small amount of implementation time." "The End Result (Meta): I got a lot of inspiration and rekindled enthusiasm out of it. Truth be told, I've been down in the dungeons battling FPLT for so long that I've forgotten to come up for fresh air. I gained some important perspective on what matters. I know I've had trouble with this in the past, but again, I'm making a big effort to move to the land of pragmatism. 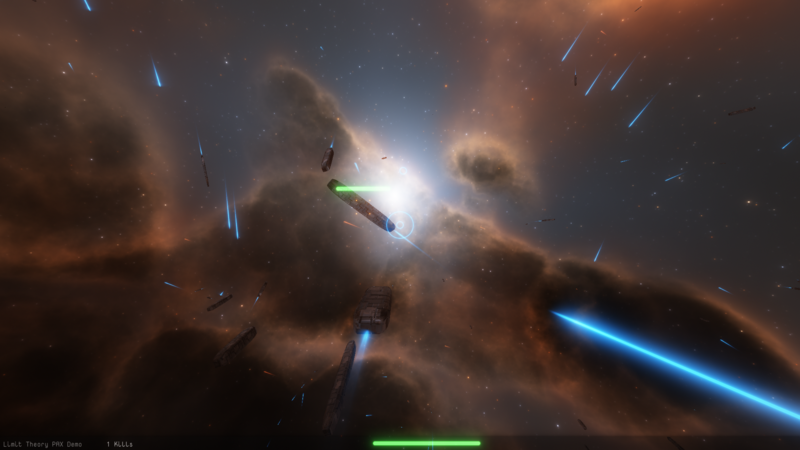 During the development of the demo, I scrapped features that it almost killed me to scrap, out of pure necessity... I didn't have time to...I didn't have time to...These things killed me deep down. But how many people made an issue of them when playing? Zero. Instead, I heard things about targeting feeling clunky, movement not feeling 'tight' enough, wanting more weapons, etc." " I got to meet some people who have been following LT and the experience of talking to them about LT and the things that made them excited made me really, really happy. I started Limit Theory to build my dream game. I'm still doing that, but as I've grown up a bit since the beginning, I think seeing the excitement and the smiles on other peoples' faces as they talk about LT gets me going more than it used to. All you guys who share my dream and have supported me in the journey to make it a reality are very much an inspiration to me at this point." The LT community is now fully convinced that I'm intent on doing things differently for the better. Right? Right?? Also, I think that a very thorough and profound thanks to Adam and Lindsey are in order, because Josh, Gonna be honest, I don't think you could have done it without them. This can't be said enough, Hyperion. Edit: On further reflection of your comment, Hyperion, I'm at a loss to understand why Nathan isn't "swimming among the code". He's done a magnificent job with creating his bot, Taiya and it's obvious to see that he has the necessary talent from the replies he gives to those who need assistance with technical matters and forum related advice. This was fun. Hope you enjoy my Dev Log review! I can't say the music in the background did much for me, Distant, but I still thought your review was up there with your best. Thanks! The music has bin put to the bin I'm listening to a lot of different music, I may end up sticking with my older music I've been using for month... we'll see! How much of my beloved Microsoft Freelancer is likely to survive in Limit Theory? Is it likely I will have to depend on other gifted coding people to wrestle with the problem of restoring elements of the Freelancer game which have been consigned to the cutting room floor or will that be unnecessary due to LT Team created superior replacements? Will there be any audio apart from the music of François and the sound effects? Will it be difficult to implement a Freelancer like storyline in Limit Theory? I haven't seen one yet that I haven't enjoyed, Distant. While I think I'll be OK with LT as its own (type of) space game, I also would be interested in hearing the Thoughts Of Josh on these questions. My perspective on them is a little different, though, based on some experience programming. I expect there will be elements of Freelancer that aren't in Limit Theory -- my question is, to what extent if any is LT being designed and coded to enable modders to create those features, and to connect them in what feels like a relatively seamless way to vanilla LT? To paraphrase Talvieno's response about story content, the fact that much of the game code will be in Lua (rather than the "hidden" core game engine code) means that lots of things can be added to LT. This most likely would include a pre-written story to be experienced by LT's players (if they install that mod). Presumably this also would apply to other aspects of Freelancer that didn't make it into LT. If so, this is a Good Thing! However, just saying "you [modders] can do it in Lua" doesn't really address the question I'm asking of how hard doing so will be -- of whether vanilla LT will be created to include some rudimentary "hooks" for adding certain types of features. With these, modders won't have to dig too deeply into the most basic Lua code, but can focus on creating story framework software and connecting it relatively easily to the existing LT code. This that I'm describing here may be completely off base. Maybe the notion of "hooks" is somehow stupidly inapplicable and no more should be said about it ever. That would be an interesting thing to know now, so that modding can get started on a realistic basis when that time comes. Maybe that's not a kind of question that can be answered now, and any response ought to wait until the whole modding system of LT is close to completion. If so, knowing that instead would be helpful. This isn't to rush anything, or to try to apply any kind of pressure -- it's more that I've long found level-setting for customers to be best done as soon as possible. I'd suspect that the process of getting Limit Theory 1.0 out there won't involve the development of tools to make Narrative oriented mods super easy for non-technically-inclined folks, and there will be a fair amount of prerequisite programming knowledge to make those at first. However, I'd also suspect that such tools will either be developed by Procedural Reality post-release, perhaps as part of the Colonies and Factions Expansions, or perhaps even by modders for modders once we can really get our claws into the code and see how everything works. Yes, I read what Josh posted in his "December 4th Soliloquy", Hyperion. It doesn't really address the questions I wanted him to answer. I'm more interested in what will be available as a straight "out of the box" game. Edit: And that promise made to me that I would be receiving a satisfying Freelancer experience. You probably should concentrate on a satisfying Limit Theory experience instead. Your Freelancer experience was unique and no game on this planet will ever bring it back. It's just not possible. Expecting the impossible is a good way to get disappointed, whatever game LT becomes in the end. You probably should concentrate on a satisfying Limit Theory experience instead. The Limit Theory experience may very well be satisfying. Your Freelancer experience was unique and no game on this planet will ever bring it back. I don't want my original experience to be reprised. The original experience may well be "impossible" to capture that doesn't mean that Limit Theory is incapable of providing an experience that matches or exceeds that experience. Expecting the impossible is a good way to get disappointed, whatever game LT becomes in the end. I get a bit tired of people telling me what's possible and what's impossible. I try not to make that mistake. I don't like the word and it's usually used by those with closed minds. I'm seeing what was once considered impossible happening on a daily basis, kostuek. And I get a bit tired of people chewing endlessly on Freelancer. But you go ahead with your open mind, no problem. I supported this project for that Freelancer experience, kostuek. I've been very open-minded about the development of Limit Theory since the Kickstarter. Unfortunately for you, I will continue adding posts to these forums about Freelancer which will more than likely cause you even greater tiredness. I suggest you either accept that as a fact or, in future, don't bother reading my posts. I suggest you either accept that as a fact or, in future, don't bother reading my posts. In fact, I will do both, not a big loss.